↑ Simkin, John. 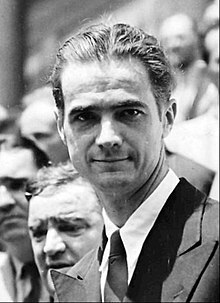 "Howard Hughes". Archived June 3, 2013, at the Wayback Machine. Spartacus Educational. Retrieved: June 9, 2013. ↑ "The Racket (1928)". Turner Classic Movies. Retrieved August 14, 2017. ↑ "Hell's Angels". Turner Classic Movies. Retrieved August 14, 2017. ↑ "51 Heroes of Aviation." Flying Magazine. Retrieved: December 27, 2014. ↑ "Howard Hughes, Our Company, History". Howard Hughes Company Website. Retrieved November 6, 2017. ↑ "Howard Hughes." MSN Encarta online, October 21, 2009. Retrieved: January 5, 2008. ↑ http://users.tellurian.com/gjurrens/famous_hams.html Archived May 19, 2014, at the Wayback Machine. ↑ "Howard Hughes." U.S. Centennial of Flight Commission, 2003. Retrieved: January 5, 2008.